Senior class president Natalie Aquadro prepares to lead her class beneath the tent for Commencement. 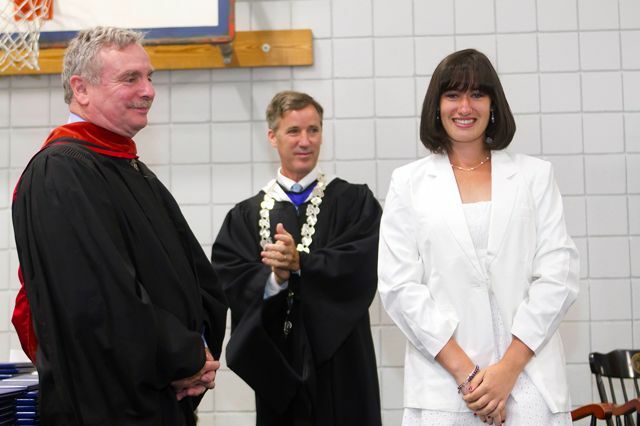 Be courageous, speakers told the Class of 2012 during The Williston Northampton School’s 171st Commencement on June 2. As rain fell outside the Athletic Center, and the graduates prepared to open a new chapter in their lives, commencement speakers reminded them to always have the courage to do the right thing, the courage to persist, and the courage to stand up for their ideals. 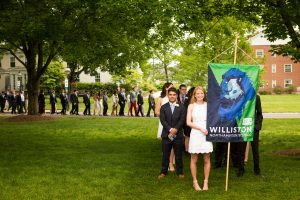 Hill reminded seniors about what they had learned at Williston—to welcome a diversity of ideas, to be self-reflective, to be good people. He urged students to continue to express their passions and their integrity even beyond the sanctuary of the school. “Courage motivates you to step in others’ shoes, to do the right thing when no one is looking or to cut a new pathway,” he said.